Fall is a great time to get to the root of your weeds! Herbicides will be very effective as the weeds will be actively taking nutrients, along with the herbicide, down to their roots. It takes advantage of the weeds’ seasonal patterns. After summer’s heat and occasional dry spells, fall’s cooler temperatures encourage both lawn and weed growth. Meanwhile, to store energy for winter, weeds are busy moving nutrients down to their roots. When herbicides are used in the fall, weeds carry those down too, efficiently poisoning the plant. It makes it harder for weeds to regrow. Digging up or hand-pulling weeds gives them less chance to grow stronger and deeper. Take advantage of this slower grower season. Weeds will multiply faster in the spring and become more difficult to control. 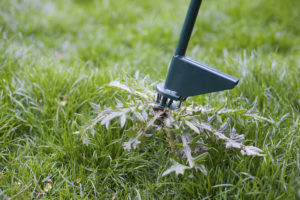 If your lawn only has a couple weeds, popping them out by hand will be a more inexpensive and still very effective option. Using an herbicide (preferably one with two or more active ingredients) in the fall will get rid of most perennial broadleaf weeds such as dandelions, plantain, clover and black medic. If the weeds aren’t too thick, you may not need to treat the entire yard. Instead, pop them out individually. You may not see the results of your work right away, but most of the weeds will disappear after the winter. Applying fertilizer between Labor Day and early October is also a good weed-control tactic, especially for cool-season grasses. Fertilizer will improve turf density as well as strengthen the grass’ root system. Your lawn will be better able to fight off next summer’s weeds, making next year’s weeds less challenging to control. Another bonus: Your lawn will also be more tolerant to the summer heat and dry periods.